Located in the colorful and lively neighborhood of Little Havana, the seed for InterAmerican Campus was planted in 1972 when the College offered a couple of night courses at the Belen Jesuit Prep School. Sixty students enrolled. By 1979, the program had blossomed into the Wolfson Campus’ Division of Bilingual Studies, enrolling 2,000 students. In the early 1980s, an influx of students from Latin America and the Caribbean led to the addition of day classes and full-time faculty. By 1986, the division had grown to “center” designation, and it moved into a building in Little Havana purchased by the College Foundation. InterAmerican Center became the largest bilingual learning environment in all of higher education. When enrollment reached 5,500, the College District Board of Trustees petitioned the state of Florida for “campus” status. 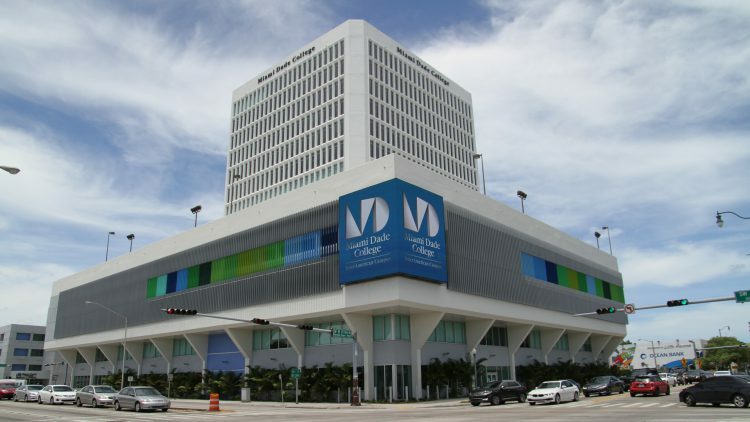 The request was approved and on March 27, 2001, InterAmerican Campus was born, becoming the sixth campus of Miami Dade College. In Fall 2016, the campus opened its beautiful new building, nearly doubling the size of the campus. Building 6—formerly known as the InterAmerican Plaza—boasts 27 new classrooms, a new Student Life Center, a new Library, Computer Couryard and Tutoring Center (the Learning Commons), a large, penthouse-level multipurpose room with beautiful views of downtown Miami, new spaces for the School of Business, School of Education, and Honor’s College, a new bookstore, and additional dining options to meet the needs of our diverse student population. Today, InterAmerican Campus offers students over 200 degree and certificate programs, including an A.S. in translation and interpretation studies, certificate programs in early childhood education, and a B.A.S. in Supervision and Management. It is also home to the dual-language Honors College, College’s School of Education, which offers bachelor’s degree programs in early childhood education, secondary mathematics education, exceptional student education, and secondary science education in the areas of biology, chemistry, physics and earth/space science.